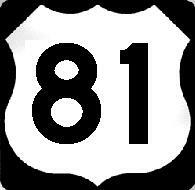 U.S. Federal Route 81 is a north-south highway in Kansas. In Kansas, this runs through the central portion of the state. From Wichita to near Minneapolis, this highway is a expressway. Info on U.S. Rt. 81 is broken down by county below.